Those are the first words spoken, by the main character, in The Fault in Our Stars. It’s a pretty bold move, sticking that right at the start; saying, not in so many words, “all those other films aren’t the truth, but ours is!” But is director Josh Boone’s tale of “boy meets girl; girl has terminal cancer” really any “truer” than other romantic comedies, or is it just your typical beautiful-people rom-com with added breathing apparatus? Out now on DVD and Blu-ray, the movie (which is based on a critically acclaimed novel of the same name, by John Green) certainly ticks all the modern rom-com boxes. 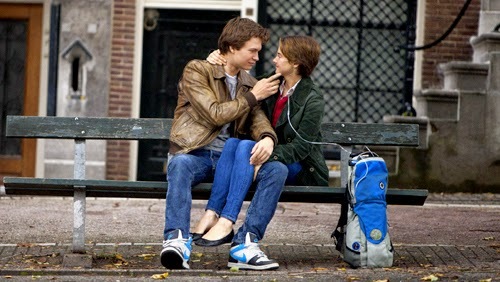 Main characters Hazel Grace (Shailene Woodley) and Gus (Ansel Elgort) definitely qualify as “beautiful people”. They get adorably flustered when they meet, bumping into doors and muttering apologies. Hazel’s parents (Laura Dern and Sam Trammell) fit the meddling rom-com parent mould to a T, while Gus does exactly the sort of endearingly quirky/goofy stuff you’d expect. There’s even a “Hazel waiting for Gus to call” montage, a romantic getaway in Amsterdam, and an “I’m no good for you” speech. It’s just that, in this case, the beautiful people have major health problems: Hazel has terminal thyroid cancer and messed-up lungs, so she has to wear a breathing tube and lug a heavy oxygen tank around all the time. Gus, meanwhile, is an amputee, having lost the lower part of his leg to bone cancer. That adorably-flustered meeting I mentioned happens at a cancer support group. And the romantic holiday? It’s almost like a military operation, with every detail planned weeks in advance, lest a lack of elevators aggravate Hazel’s condition. And that’s awesome. This is a movie about a relationship, where the characters have to deal with cancer – not a movie about cancer, where the characters also have a relationship. The cancer stuff never feels exploitative or tacked-on; instead, it’s used sparingly and sensitively to make Gus and Hazel feel like star-crossed lovers and give an unshakeable feeling of melancholy and uncertainty to the proceedings. This is bolstered by the fact the film cleverly telegraphs two likely endings – almost from the start, actually, which put paid to my smug certainty that I’d already figured out where things were headed, and made me feel just as uneasy as the characters. Meanwhile, Woodley and Elgort (who have an insane amount of on-screen chemistry) deliver quite-frankly-excellent performances as Hazel and Gus – particularly Shailene Woodley, who has that same whispery quality as Jennifer Lawrence and had me hanging on her every word. I felt like I really got to know and love Gus and Hazel in the two hours I spent with them, which meant I was woefully under-prepared for all the horrible things I was sure were about to happen to them. This is a film that knows exactly how it wants you to feel, and exactly how to make you feel it – everything about it just works, perfectly, exactly as the film makers intended, and I’m still thinking about it days later. I’m not the sort to be emotionally affected by movies, but I can’t seem to shake this one off – and I know certain parts of the film will stay with me for a very long time. Even a slightly incongruous-feeling side story about a cockbag author (ham-fistedly portrayed by Willem Dafoe) wasn’t enough to put a dampener on all the other brilliantly-executed stuff that was going on. So no, The Fault in Our Stars isn’t “just” another beautiful-people rom-com. It’s so much more than that. It’s a well-written, smart, well-acted, impactful rom-com that genuinely does ring “truer” than others in its genre. It’s a romantic comedy with staying power... potentially, one with the power to impart genuine life lessons and leave its viewers with a new outlook on the issues it raises. I’m not sure about that last bit, yet; I’m still busy trying to digest everything.